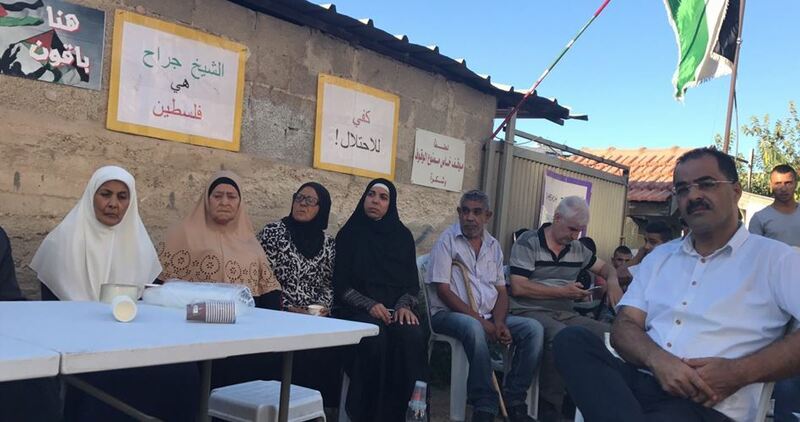 Israeli magistrate court in Occupied Jerusalem will consider on Thursday the home-demolition of Shamasnah Jerusalemite family’s home, threatened with eviction, in Sheikh Jarrah neighborhood in the city. Hatem Abdulqader, Fatah Movement official of Jerusalem affairs, said that an appeal was filed by lawyer Saeed Ghaliya based on new data and documents that prove the family’s home ownership that dates back to 1964. The eviction order which was supposed to take place last Sunday was, as a result, postponed and the house was handed to settlement societies. The family has continued their protest sit-in before the home for the second week in a row. For his part, the UNRWA Spokesman, Christopher Gunness, expressed his concern over the humanitarian consequences of the Israeli threat to evict the house. He called on Israeli occupation authorities to reconsider the decision. Israeli occupation authorities (IOA) on Wednesday issued stop-construction orders against Palestinian houses near Yatta city to the south of al-Khalil and distributed a number of demolition notices in Silwan in Occupied Jerusalem. Coordinator of the national committee against the wall and settlements south of al-Khalil, Rateb al-Jabour, said that Israeli occupation forces accompanied Administration Committee members who distributed stop-work notices against three houses in Khirbet Janaba to the east of Yatta under the pretext that they are located in Area C.
Following Oslo II Accord in 1995, the West Bank was divided into three divisions: Areas A, B and C which comprise 18%, 21% and 61% of the West Bank respectively. Area A is exclusively administered by the Palestinian Authority (PA), and Area B is administered by both the PA and Israel, while Area C is completely controlled by Israel; therefore, any Palestinian projects to be implemented in Area C require the approval of the Israeli authorities. Meanwhile in Occupied Jerusalem, the Israeli-controlled Jerusalem municipality crews distributed new demolition notices against a number of Palestinian houses in Silwan town. On Tuesday, Israeli bulldozers demolished two houses in Silwan under the pretext that they lacked the required licenses. Israeli occupation forces (IOF) on Wednesday demolished two coal-production facilities and seized several tons of wood in Ya'bad town to the southwest of Jenin, local sources reported. Representative of coal workshops in Ya'bad, Kayed Abu Baker, said that an Israeli force accompanied by bulldozers broke into the area and confiscated several tons of wood used for manufacturing charcoal. In an interview with Quds Press, Abu Baker added that the Israeli bulldozers swept away huge amounts of coal that were still under manufacturing causing a fire in the neighboring lands. Abu Baker explained that Palestinian coal-production workshops are targeted at the request of Israeli settlers in the nearby settlements who claim that these workshops pollute the environment and cause health problems. Abu Baker stressed in previous statements that Israeli settlers invent false excuses to seize more Palestinian lands in favor of expanding settlements. He pointed to the existence of similar coal plants in the 1948 occupied Palestinian territories near the Israeli population centers yet no complaints are raised against them. He noted that there are more than 30 coal-production workshops in the area which are repeatedly targeted by the IOF and which represent the main source of income for more than 1,000 Palestinian families living in Ya’bad and the surrounding villages. The Palestinian unionist affirmed that the demolition on Wednesday took place without a prior warning, adding that owners of coal-production facilities in the area had previously filed complaints to human rights organizations and courts about the Israeli targeting of their facilities without reaching any positive result. He continued that they will keep in contact with the concerned authorities to take the necessary legal steps against these violations. 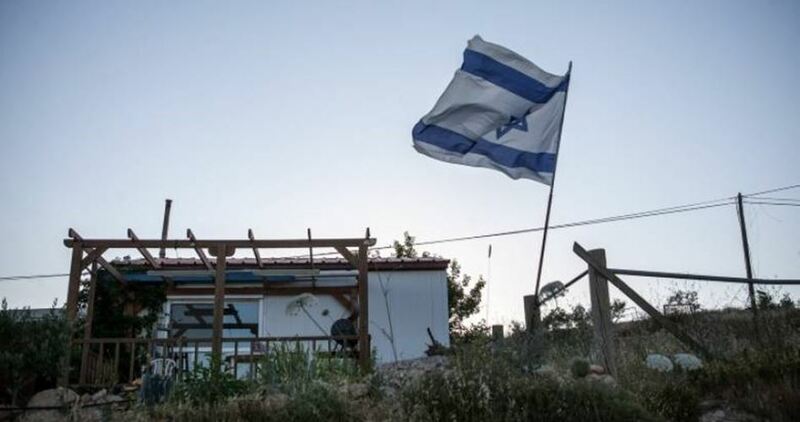 Israeli settlers on Wednesday morning installed caravans on a Palestinian land adjacent to the separation fence between Beitar Illit settlement and Nahalin town, west of Bethlehem in the southern West Bank. 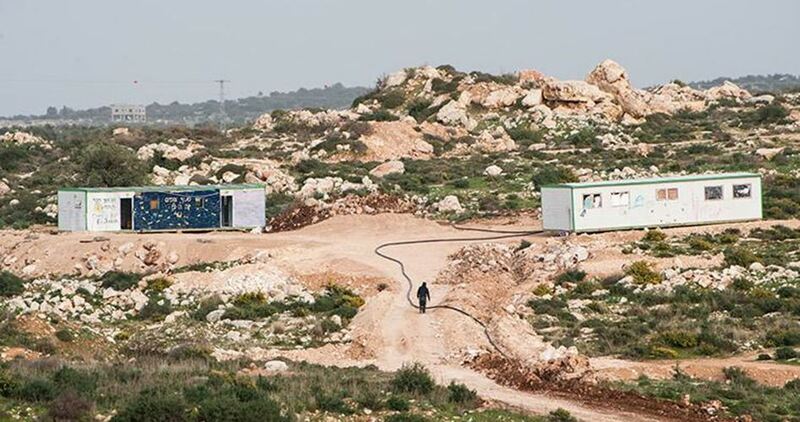 Head of the town’s council, Subhi Zeidan, said in a press statement that a group of settlers from Beitar Illit outpost, which was illegally established over Palestinian lands of Nahalin, Housan and Wad Fokin towns, set up ten caravans in the area. He opined that these moves are aimed at seizing as much as possible of the Palestinian land for settlement expansion. 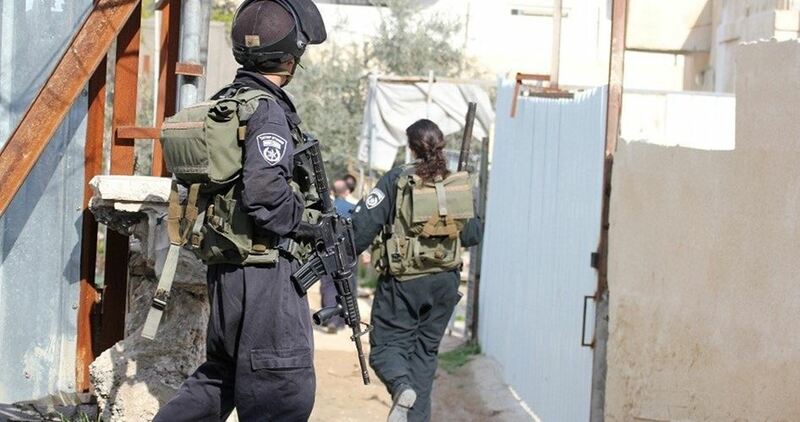 Israeli soldiers invaded, on Wednesday at dawn, the village of Kobar, northwest of the central West Bank city of Ramallah, and demolished a home belonging to the family of a Palestinian who stabbed, last month, three Israelis to death, in their home at a nearby colony. 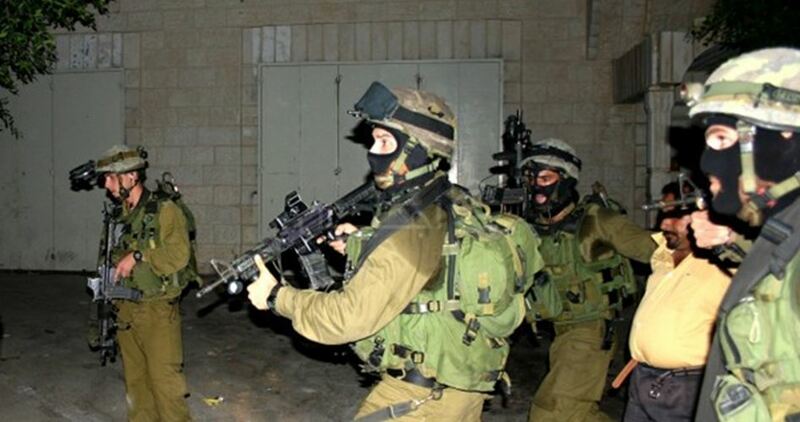 The soldiers also injured 26 Palestinians during ensuing clashes. Medical sources in Ramallah said the soldiers shot 26 Palestinians during the clashes; one of them is a cameraman, identified as Mohammad Radi, who works for Palestine TV. The cameraman was shot with a rubber-coated steel bullet in his face, after a soldier shot him from a close range, while he was filming the clashes. The sources stated that thirteen Palestinians were shot with rubber-coated steel bullets, and thirteen others suffered the effects of teargas inhalation. It is worth mentioning that the soldiers have recently abducted the parents, and uncle, of Omar al-‘Abed who carried out the stabbing attack last month. The three slain Israelis have been identified as Yosef Salomon, 70, his daughter Chaya, 46, and his son Elad, 36. As part of the collective punishment policy adopted by the Israeli forces against the Palestinian civilians accused of carrying out attacks against Israeli soldiers or/and settlers, on Wednesday, 16 August 2017, the Israeli forces demolished a house belonging to ‘Omer ‘Abdel Jalil al-‘Abed in Kobar village, northwest of Ramallah. The Palestinian Center for Human Rights (PCHR) accordingly condemns this new crime, which is added to the series of Israeli crimes committed in the occupied Palestinian territory (oPt). PCHR also emphasizes that the crime is part of the Israeli forces’ collective punishment policy against innocent Palestinians in violation of Article 33 of the Fourth Geneva Convention that prohibits collective penalties and reprisals against protected persons and their property. PCHR calls upon the international community to offer protection to the civilians in the oPt and ensure the application of the aforementioned convention. According to PCHR’s investigations, at approximately 01:30 on Wednesday, 16 August 2017, Israeli forces backed by 20 military vehicles and accompanied with a digger and bulldozer moved into Kobar village, northwest of Ramallah. They then surrounded a 2-storey house belonging to the family of ‘Omer ‘Abdel Jalil al-‘Abed. The house was built on an area of 180 square meters, sheltering 7 members, including a girl with special needs. The Israeli vehicles immediately destroyed the walls of the ground floor, which was inhabited, while the second floor, which was under-construction, sustained severe damage. Meanwhile, the Palestine TV crew was covering the house demolition, so the Israeli soldiers deliberately fired rubber-coated metal bullets at the Palestine TV photographer, Mohammed Radi. As a result, he was hit with a bullet to the nose and then taken by an ambulance belonging to the Palestinian Red Crescent Society (PRCS) to Palestine Medical Complex in Ramallah for medical treatment. Local sources in the Complex said that the bullet fractured his nose. It should be mentioned that the abovementioned civilian has been arrested by the Israeli forces since 21 July 2017 on grounds of carrying out a stab attack in “Helmish” settlement, northwest of Ramallah that resulted in the killing of 3 settlers. The Israeli forces have also arrested his parents; 2 brothers, Munir and Khalid; and his uncle, Ibrahim al-‘Abed, accusing them of having prior knowledge of the attack. On 10 August 2017, Israeli forces on the same grounds, demolished 2 houses and closed a third one with compact cork in Deir Mesh’al village, northwest of Ramallah. Meanwhile, another house was demolished in Silwad village, northeast of the city. Therefore, PCHR reiterates its call upon the international community to take immediate action to put an end to the Israeli crimes. These grave breaches constitute war crimes under Article 147 of the same Convention and Protocol (I) Additional to the Geneva Conventions regarding the guarantee of Palestinian civilians’ right to protection in the oPt. Israeli forces at dawn Tuesday broke into some of the family homes of Jerusalemite martyrs who carried out anti-occupation attacks in Occupied Jerusalem. The Israeli raids took place at each of Ras al-Amoud, Beit Hanina, al-Issawiya and Wadi al-Joze neighborhoods in the city. Israeli forces who stormed the Jerusalemite homes seized a sum of money estimated at 130,000 shekels at the pretext of being received from Hamas Movement. During the storming campaign, the Israeli forces also searched homes of seven Jerusalemites families and confiscated jewelry in addition to a private car. Israeli bulldozers demolished on Tuesday three Palestinian buildings in Occupied Jerusalem under the pretext of unlicensed construction. Israeli forces, escorted by two bulldozers and military jeeps, stormed al-Issawiya village and demolished a home owned by the Palestinian citizen Abdullah Hamdan. Reporting from the city, a PIC news correspondent said 500 Israeli soldiers cordoned off the village at daybreak and closed off its main access roads, blocking Palestinians’ movement inside and out. 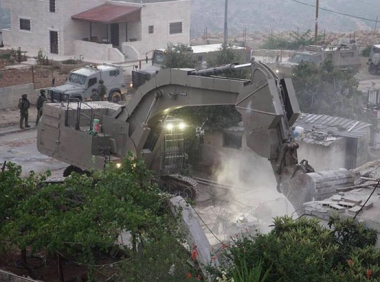 The Israeli bulldozers also razed a home belonging to Abdul Karim Abu Esneineh in al-Bustan neighborhood. 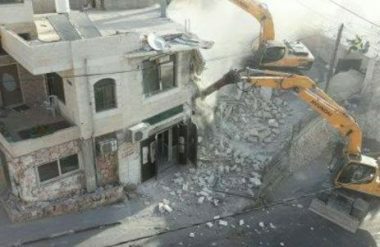 A commercial and residential building, owned by Na’im Abu Dweih in Jabal al-Mukabbir, was demolished by the Israeli forces without prior notifications. According to the family, the building was built some 10 years ago and is surrounded by structures constructed over 80 years ago. Member of al-Issawiya’s Defense Committee Mohamed Abu al-Humus said the demolitions make part of a policy of collective punishment perpetrated by the Israeli occupation authorities for over 18 years against the Palestinians of al-Issawiya, adding that 200 apartments are threatened with demolition and 16 others were razed to the ground since the start of 2017. 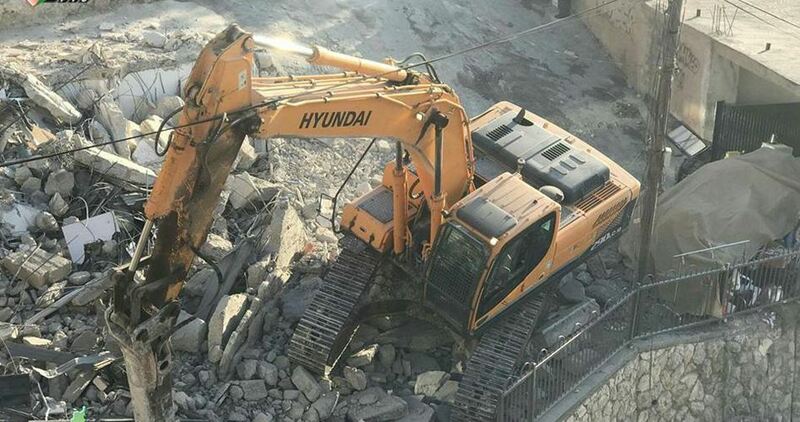 Israeli soldiers and personnel of the City Council of occupied East Jerusalem, invaded on Tuesday morning, the town of a-‘Eesawiyya, in occupied East Jerusalem, and demolish a two-story building, used for residence and commercial purposes. The WAFA Palestinian New Agency quoted Raed Abu Mayyala of Jerusalem’s Follow-Up Committee, stating that the building was modified ten years ago on the original structure, and included apartments and stores. Abu Mayyala that dozens of soldiers and police officers, accompanied the City Council bulldozers, invaded the area, and surrounded the building before demolishing it. The soldiers also instated a strict siege on the entire area, especially around the demolished building. 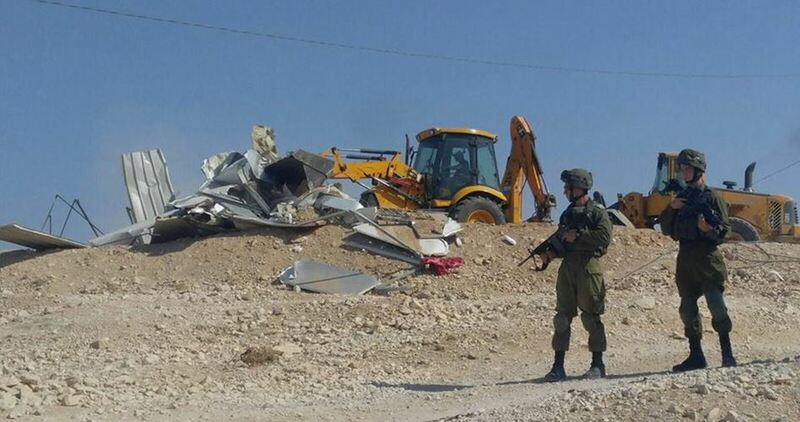 The Israeli Occupation Forces (IOF) demolished Monday afternoon a number of Palestinian facilities south of Yatta town in the southern West Bank province of al-Khalil. According to the PIC reporter, several Israeli military vehicles stormed Zawadin area in the town and carried out bulldozing operations before starting to demolish residential and agricultural facilities belonging to Hadhalin family. During the raid, Israeli settlers of the nearby illegal settlement of Karmiel carried out provocative acts and attacked Hadhalin family members under the protection of Israeli forces. On the other hand, Israeli bulldozers razed Palestinian-owned lands with the aim of expanding the Maon illegal settlement at the expense of local vineyards. The Israeli occupation army on Sunday annexed around 47 dunums of Palestinian-owned land in ad-Dhahiriya town, south of al-Khalil province. Chief of the town’s municipal authority Rateb al-Hawareen said that a military order issued by the regional commander stated that 47 dunums and 261 square meters of land near ad-Dhahiriya crossing would be seized for military purposes. Hawareen affirmed that the annexed land belongs to the family of Abu Allan, who intends to file a legal objection against the military order. The Israeli army claims it will use the land to expand the crossing and set up new security fortifications in the area. Israeli occupation forces (IOF) stopped and confiscated a Palestinian bus belonging to Tamimi transport company on Sunday at Za'tara military checkpoint to the south of Nablus. 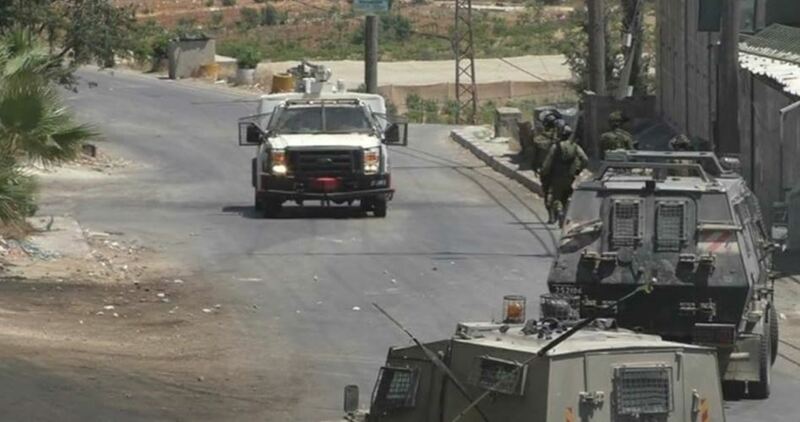 Mohammed Hijazi, the bus driver, told the PIC reporter that the IOF soldiers stationed at Za'tara checkpoint forced him to stop, confiscated his ID card and searched the vehicle. Hijazi said that a car belonging to the so-called Civil Administration arrived at the site and informed him about the confiscation order claiming that the bus had partaken in transporting youth protesters to military checkpoints to participate in clashes with the IOF. The bus was then taken to Huwwara checkpoint, he added. Israeli settlers of Yitzhar settlement on Saturday installed caravans on a Palestinian agricultural land which has been illegally confiscated near the West Bank city of Nablus for settlement expansion. Other groups of Jewish settlers set up new caravans on Palestinian lands in Qousin town to the west of the city. 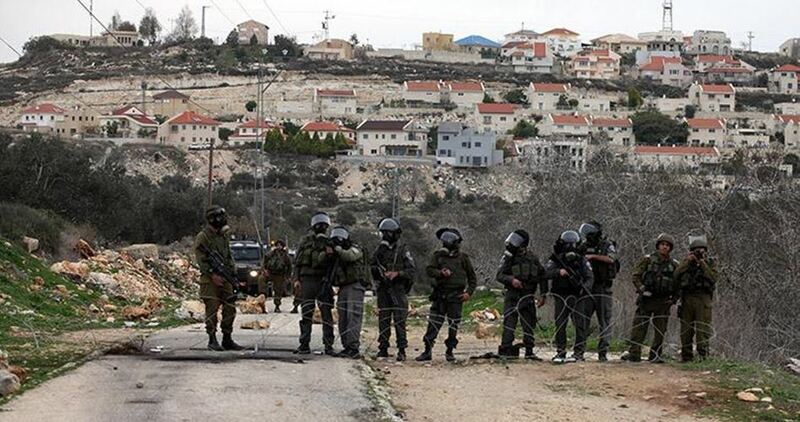 Settlers of Ennab settlement east of Tulkarem city also stalled another number of caravans in the area. Ghassan Daghlas, who monitors settlement activities in the West Bank, said that these moves indicate the acceleration of illegal settlement construction in the West Bank in order to seize as much as possible of the Palestinian land. The Israeli District Committee for Planning and Construction approved Saturday the demolition of 12 Palestinian buildings east of occupied Jerusalem, Israeli media sources reported. 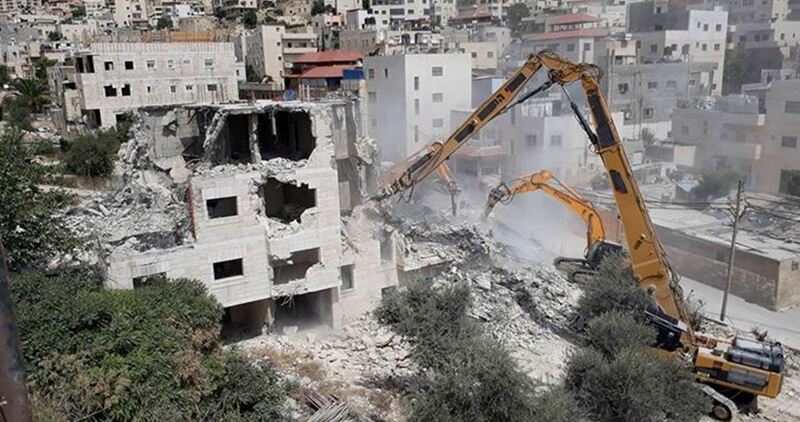 Urshalim Hebrew newspaper affirmed that the District Committee for Planning and Construction issued demolition orders against a number of buildings in Beit Hanina town east of the occupied city. On the other hand, the weekly paper revealed that Rabbi Eliyahu Weber decided to build a Jewish school near the entrance to al-Aqsa Mosque. Israeli settlers’ break-ins into al-Aqsa have escalated despite the growing tension in the holy shrine, the paper pointed out.